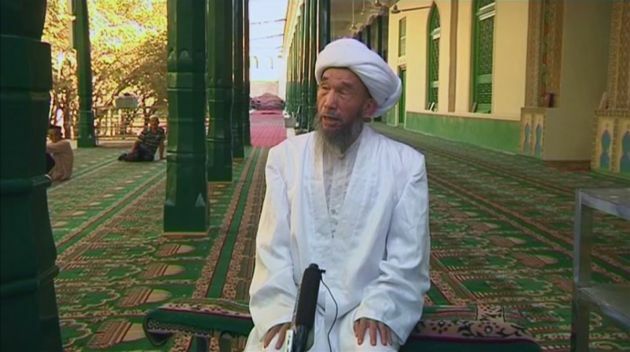 (Photo: REUTERS / Reuters TV)Juma Tahir speaks during an interview at Id Kah Mosque in Kashgar in this still image taken from video dated August 3, 2011. Three suspected Islamist militants armed with knives and axes killed Tahir, the imam of China's biggest mosque in the western region of Xinjiang, on July 31, 2014, the authorities said, days after a knife-wielding gang attacked state buildings in the same region. All three attackers, who were named by the government, had ethnic Uighur names and the imam, Tahir, was a well-known pro-government Uighur who led prayers at the Id Kah Mosque in the old Silk Road city of Kashgar. Authorities in Xinjiang province have arrested a man accused of masterminding the attack on the imam at China's biggest mosque, Chinese State media reports. Police in the restive Xinjiang province arrested Aini Aishan, 18, a member of the Uighur ethnic minority, two days after imam Jume Tahir was stabbed to death on July 30. News of Aishan's arrest posted on the news website China.org.cn on August 24. Tahir led morning prayers on July 30 and had just stepped out of the Id Kah mosque in Kashgar, the most influential mosque in Xinjiang, when he was attacked. Responding police officers fought off the attackers, killing two suspects, while managing to arrest a third suspect, Nurmemet Abidili. An article from China Daily, a State-run newspaper said that the New York Times quoted in its report that Abidili had been shown "terrorism videos" and other extremist material by Aishan. Abidili appeared to be interested in Islam and shared his curiosity with Aishan, whom he met at a construction site, the report said. The report said Aishan had contact with a local extremist group, whose members purportedly gave him extremist materials like videos and other documents such as "prohibited religious publications." On Sunday, Abidili was interviewed by a local television station in Urumqi, the regional capital of Xinjiang, where he confessed to killing the imam. "I thought killing the imam would be a grand achievement and would make us more influential," said Abidili, who wore a blue prison jumpsuit in the interview. Tahir's killing sparked outrage in the region, which has seen flashes of ethnic violence in the past months. Tahir had been known as a supporter of the government run by the the dominant Han ethnic group in the region. Both the Han and the Uighurs have clashed repeatedly in past months, as the minority group continued to suffer from a crackdown on them. Authorities blamed Uighurs for the rise of radical Islam in China, as incidences of extremist attacks have kept occurring. Over the weekend, China executed eight people deemed to be terrorists, including three who launched an attack at Tiananmen Square.